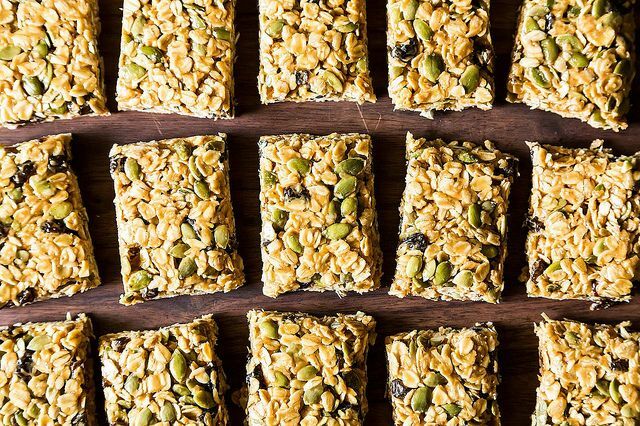 Today: A granola bar you don't have to bake, with a recipe that won't tie you down. Summer is quickly approaching, which means more picnics, hikes, outdoor walks, and other celebrations of the open air. This time of year, I like to maximize my time outside by stocking up on portable, nutritious snacks that allow me to be active without worrying about going inside to eat. More: Looking for more snacks to fill your backpack? Try Gena's White Bean Dip. I’m a sucker for sweet, salty snack bars, but tasty vegan ones can be hard to find: many store-bought options are full of dubious ingredients, while recipes for homemade bars often contain honey (which isn't vegan!). For ages, I searched for a granola bar recipe that was vegan, easy to make, and -- most importantly -- adaptable. I've finally found the perfect mix of oats, nuts, dried fruit, and nut butter, and it has become a go-to in my busy student life. Substitute finely chopped dried figs or dates for the raisins. Replace the pumpkin seeds with chopped pistachios, and replace raisins with 1/2 cup dried cranberries. Replace the pumpkin seeds with chopped walnuts, and add 1 teaspoon cinnamon to the nut butter and sweetener mixture. If you're feeling exotic, replace the raisins with goji berries. No matter what, it’s hard to go wrong with this combination. Enjoy it -- and all of the outdoor activities it will fuel you for! Tell us: what do you like to add to your granola bars? These look yummy! Could you substitute maple syrup instead of agave? Why would you use brown rice syrup - it's a concentrated sugar source made from brown rice which has been shown to contain worrisome levels of arsenic. Some brown rice in the diet is ok as a whole food source but this is a very processed product. Agave nectar is quite high in it's Fructose content - people started choosing it because it has a lower glycemic index but that is only because of it's higher fructose ratio. I would recommend pure maple syrup as the best choice. I made these a while back and unfortunately they didn't go over very well at my house. They came out to soft, and kind of raw tasting according to my kids. What size pan do you make these in? Hello - I love the sound of these bars, but I wonder what would make a goof alternative to nut butters, in order to make something school-yard friendly? Tahini is the only thing that comes to mind, but I'm not sure it would taste as nice. Any other ideas? These look simple and amazing! 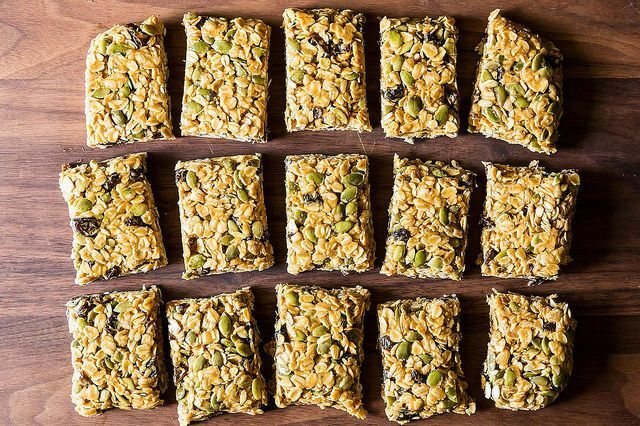 I've tried granola bars before with not-so-awesome results... now I have to try yours! can you give me some idea of the nutritional value of one of these delicious looking bars? I love homemade granola bars! This looks the perfect snack for a summer bike ride. sounds delicious! thanks for the recipe, I have been looking for something like this for a long time, quick and easy. I realize it has nuts already in the butter but being the bad girl I am I would add some pecans or almonds along with dates into the mix. Pecans and dates would be awesome! I think creamy raw honey would be perfect in these if you aren't vegan. I've used raw honey in these, and it tastes great! Especially with almond butter + cinnamon. These look delicious, but I am allergic to oats. Do you think something else could be put in their place? coconut shreds? quinoa flakes? I'd try quinoa flakes! 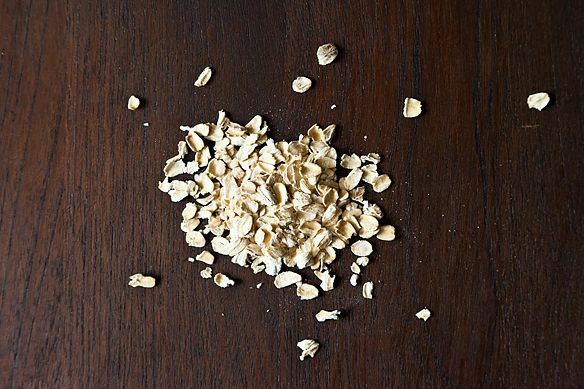 You may need to adjust measurements and add a bit more of them than the oats called for. Does it matter whether the peanut butter is the all-natural type or not? We've used both -- it's just a matter of preference! The great thing about this recipe is that it's super adaptable. Something to consider about agave nectar, it's not as healthy as it's been portrayed. It's 90% fructose, and is low-glycemic because it's processed by the liver, but the high fructose content can lead to non-alcoholic fatty liver disease. http://www.huffingtonpost.com/dr-jonny-bowden/debunking-the-blue-agave_b_450144.html. Tina, I'm certainly not one to tell you that agave is a healthy food. It is a concentrated sweetener, like all concentrated sweeteners, so there's a time and a place for it! It is, though, a convenient vegan alternative to honey, and less pricey than maple syrup. Just tasted these in our swanky test kitchen here at Food52 and there were really delicious. Creamy not at all tacky. Any chance you could use maple syrup instead of brown rice or agave? You can! I've tried it and they came out great. If you don't follow a strict vegan diet, you can also experiment with honey. Yup! Maple syrup will be fine. A little more pricey, but delicious. what kind of sweetener and how much? Sorry about that -- the recipe has been updated! It calls for 1/2 to 2/3 cup agave nectar or brown rice syrup (depending on how well things stick together).